Commonwealth Stamps Opinion: 424. Iraq. Iraq was part of of The Turkish Empire from 1638 and comprised the vilayets of Basra, Baghdad and Mosul. At the beginning of the First World War, British troops were landed at the port of Basra to protect the oil pipeline there and they occupied the town on 22 November 1914. The British subsequently occupied Baghdad in 1917 and Mosul, in the north, on 1 November 1918. Turkish stamps were overprinted "BAGHDAD IN BRITISH OCCUPATION" and surcharged (depicted above and below) for use in Baghdad and issued on 1 September 1917. 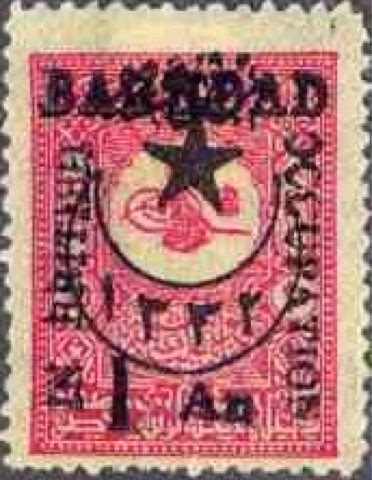 A different overprint was also applied to some stamps - this took the form of a six-pointed star with the the date "1331" in Arabic positioned inside a crescent (an additional 1 anna value had the overprint which was in the form of a five pointed star with the date "1332" in Arabic). 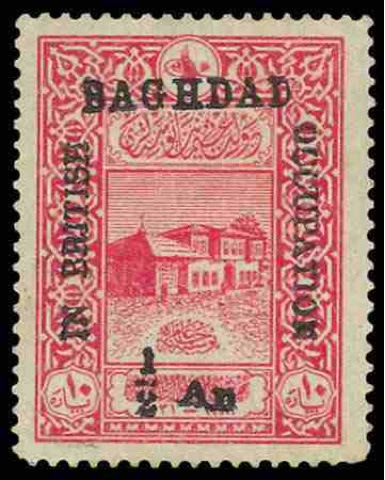 These stamps were also issued in Mosul on 28 January 1918. 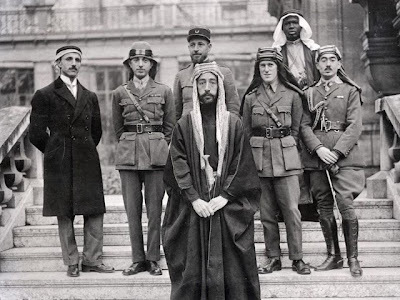 The British and the French had shown their intentions to carve up the Middle East into spheres of their own influence by the Sykes-Picot Agreement which was concluded on 16 May 1916. By this agreement, the French were allocated control of northern Iraq, Syria, Lebanon and south-eastern Turkey and the British were to gain the coastal strip between the sea and the River Jordan, Transjordan, southern Iraq and a small area which included Haifa and Acre. 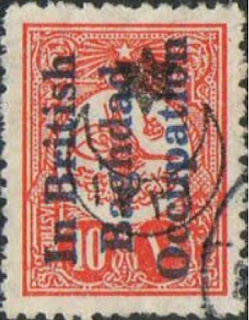 The British Occupation of Iraq ended on 25 April 1920 when the Supreme Council of The Allies assigned a Mandate of The League of Nations to Britain to administer the territory. The French deposed King Faisal of Syria on 24 July 1920 and in March 1921 at the Cairo Conference, the British decided that he would be an acceptable leader for Iraq. 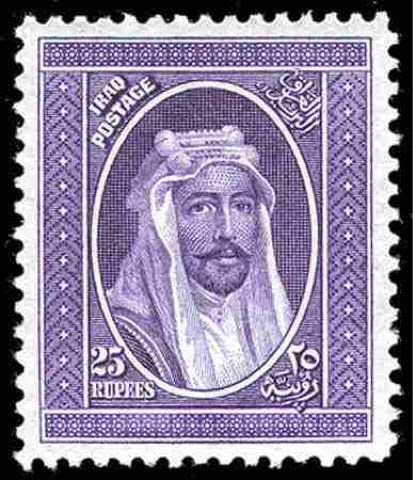 King Faisal was made King of Iraq on 22 August 1921. (Lawrence of Arabia) stands behind his left shoulder. 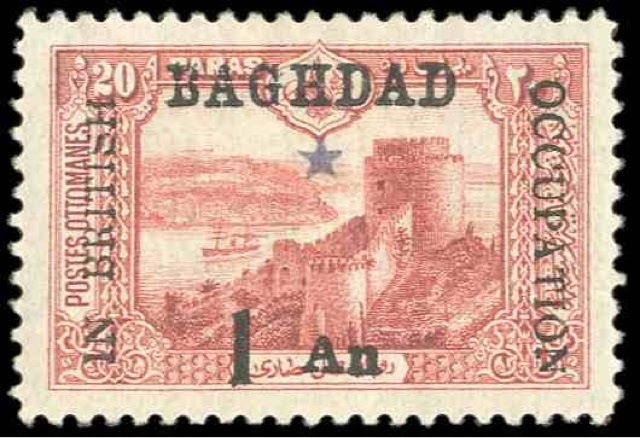 National flag of Iraq, 1921 - 59. On 3 October 1932 Great Brirain gave up its Mandate in Iraq and the country became a fully independent Kingdom with King Faisal I as its Head Of State. 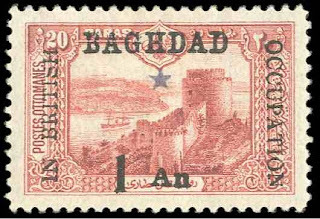 However Britain continued to retain strong links with, and influence over, the country and in 1956 Iraq signed the Baghdad Pact with Britain which established an alliance of Britain, Iraq, Turkey, Iran and Pakistan. 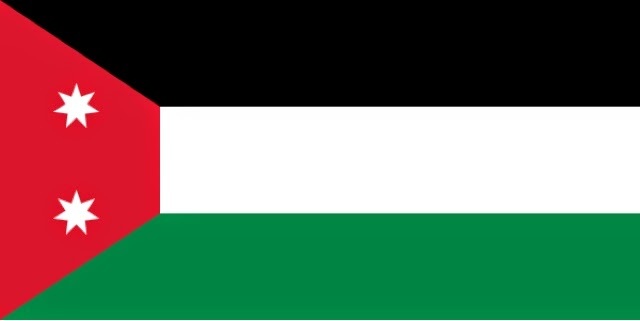 In 1958, Jordan and Iraq proposed a Union of Hashemite monarchies together with Kuwait but Britain did not want to grant independence to Kuwait and relations between Britain and Iraq grew icy with the latter becoming increasingly isolated. On 14 July 1958, King Faisal II was deposed in a military coup and subsequently executed by the revolutionaries and Iraq then experienced a sequence of military regimes which culminated in the rise to power of Saddam Hussein. This tyrant fought a war with Iraq's Shi'ite neighbour Iran and then invaded and annexed another neighbour, Kuwait in 1990. The occupation of Kuwait was resisted by an international force which included the British and other Commonwealth forces which led to the expulsion of the Iraqis from Kuwait. 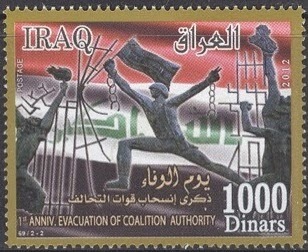 Cover from British soldier in campaign to liberate Kuwait, 1991. 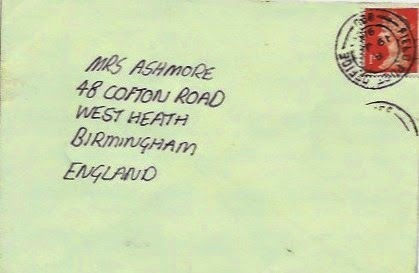 Postmark: FIELD POST OFFICE 999, dated 19 JA 91. Then, in 2003, under the false pretext that Saddam Hussein's regime was in possession of weapons of mass destruction, United States forces, supported by the British, invaded Iraq and deposed Hussein who was eventually captured and executed. British forces occupied the southern part of Iraq centred on Basra while US forces occupied Baghdad, central Iraq and northern Iraq. The US-British forces established a Coalition Authority to rule Iraq and a number of Iraqi groups, including a group called the Islamic State Of Iraq, fought against the Coalition forces which led to a period of sustained conflict which lasted until December 2011 when the Coalition Authority came to an end. The British had withdrawn their last troops from Iraq in May 2011 after an 8 year-long campaign. 429. For King And Empire. 428. Australian Stamp Frenzy Begins. 426. The Search For Universal Mail Stamps. 317. Ghana's Memorial To Previous President. 423. Canada's Haunting Stamp Designs. 419. Papua New Guinea's Greetings Stamps. 417. Never Ending New Issues. 415. Rare Bird Spotted In Guyana.